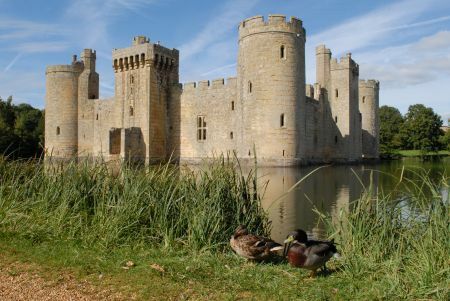 Bring history to life with a visit to Bodiam Castle for your school or college pupils. We have a range of activities to cater for all ages and abilities. Make history fun on a learning day at the castle. We offer activities from Foundation Stage to Key Stage 4, personally tailored to your group and in tune with National Curriculum initiatives. We have three activity sessions for younger children. A fun role-play session that transports children back to Medieval times. Includes castle tour, dressing-up and an introduction to Medieval food, drink, music and games. This is the story of Ralph. Learn about knights and armour as you listen to a story about a boy aspiring to become a knight. Piece together a small suit of armour, and then try some real pieces on! Short tour included. Be introduced to the people who lived and worked in the castle. Learn about the different things the Dallingridge family would have done on a daily basis, and discover the roles of the people who worked for them. Tour and dressing up included. We have two sessions for older children. Was the castle, envisioned by the infamous Sir Edward, built for defence or comfort? Learn about the castle’s many attack and defence features through the eyes of an attacking army, while also discovering the many hidden luxuries this 14th-century home held. Our aptly named armour session, 'Armed & Dangerous' takes a look at medieval warfare. Take an inside look at a medieval army, at their armour, combat skills and code of conduct before trying on some of our armour collection. For GCSE and A Level students we offer bespoke tours. Please e-mail our schools department or call us on 01580 831324 who'll be happy to tailor something to your requirements.